It takes more thought than you might expect to move people safely from the top of the hill to the bottom and back again. This summer the MIC and area non-profits have partnered to do a pedestrian study of the Lincoln Park Neighborhood of Duluth. The study will look at the way that people who walk and bike (especially school-aged children) move up and down the hill, with the aim of finding and encouraging the best possible route between the site of the New Lincoln Park Middle School and the Duluth Heritage Sports Center and the proposed Cross City trail. It’s a short study, slated to be completed in just six weeks. 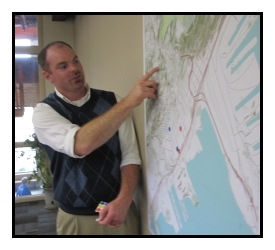 A diverse group of community groups, led by MIC Senior Planner James Gittemeier (pictured) and assembled by Cliff Knettel, Executive Director of NHS Duluth, all share the view that a well designed pedestrian plan benefits the entire neighborhood. Other study participants include the Engineering department for the City of Duluth, Fit City Duluth, Local Initiatives Support Corporation of Duluth (LISC), and neighborhood volunteers. Looking at maps and discussing best routes is one thing, but getting out there on the ground is another. Study committee members will perform a walkability audit of the paths most likely to be used by students. Findings of the audit, along with its recommendations, will serve as the basis for the Lincoln Park Middle School Safe Routes to School grant application for the 2012 round of applications. Safe Routes to School is a federally funded program that promotes children walking and bicycling to school by funding targeted improvements to bicycle and pedestrian infrastructure in school areas. Duluth has received a number of these grants in the past. Stay tuned for more information as this study moves forward.